The Sustainable Development Goals (SDGs) should be monitored in a way that both captures the experiences and views of youth and includes young people in processes that hold governments to account for these global commitments. The Working Group on Youth-Inclusive Governance Indicators has identified a list of national- level indicators and methods for monitoring Goal 16 Targets 16.6, 16.7 and 16.10 of the SDGs. These targets were chosen for their focus on core aspects of governance – effective, accountable and transparent institutions; responsive, inclusive, participatory and representative decision-making; access to information and protection of fundamental freedoms – which if achieved, will enable progress across the sustainable development agenda. Our recommendations contribute to a ‘basket’ of Goal 16 indicators and encourage the use of multiple and diverse data sources, including civil society and citizen-generated data, to monitor progress. The recommendations seek to complement and support global-level review processes and to ensure that national-level monitoring is youth- sensitive, by taking into account the role, position and experiences of children and young people. 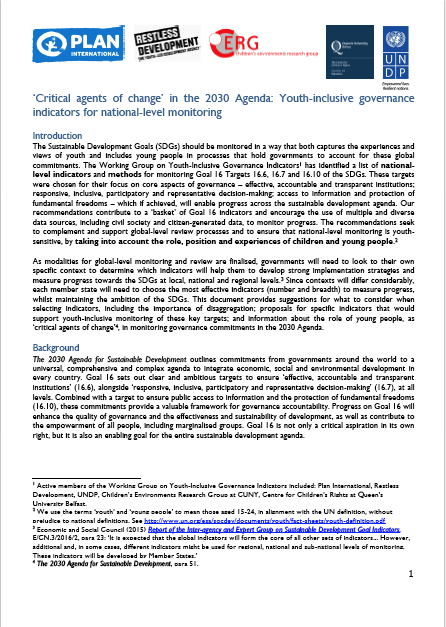 This document was authored by Chelsea Marshall, with support from Plan International, and is a product of the Working Group on Youth-Inclusive Governance Indicators, composed of: Restless Development, UNDP, the Children’s Environments Research Group (CUNY), the Centre for Children’s Rights (Queen’s University Belfast), and Plan International. The Working Group recognises the contribution of young people, including Youth Governance and Accountability Task Team members, who have informed the process.